Alpers trout aren't just any fish. Hand-fed and raised in the pure streams and ponds of Alpers Owens River Ranch, Alpers trout are exclusive to the Eastern Sierra. 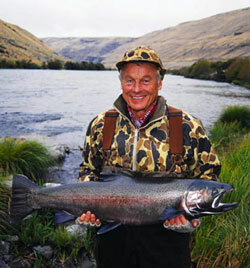 Alpers trout average 2 to 3 pounds and are prized trophies sought by anglers. The Alpers family has perfected growing trout famous for their size, fight, wildness, and their tender pink flesh. In the family since 1906, the Alpers Owens River Ranch was originally a cattle ranch. It was converted into a fishing ranch in the 1920s. During the '70s and '80s, Tim Alpers and his father raised fish primarily to stock their family ponds. In 1984, local communities requested that Alpers grow and stock bigger trout to supplement fish being stocked by the Department of Fish and Game. Today, raising trout is Alper's primary occupation. Local and private funding helps stock over 60,000 pounds of Alpers trout in lakes and streams from southern Inyo County to northern Mono County. "Alpers trout are exclusive to the Eastern Sierra. These are fish raised on the bounty of the Eastern Sierra to benefit the local economy. You won't find these trout anywhere else in the world," Alpers said. Here's the schedule for this year.